We are starting the final week of BM#52, this week I will be doing Temple Prasadams. This theme will feature three interesting temple prasadams from different parts of India. I tried not to repeat the state and gather as much as information as I could. This theme is quite a challenge in many ways. One I am not a great temple goer, two I have given company to people who think that temple visits are meant to be vacations. So you can imagine I have visited lot of temples all through my growing up years. And continuing now with Hubby dear. I know those are contradictory statements, however these are things that has made me what I am. one that begins and ends with daily long hours of prayers and traditional customs. The other that says one does not have to go to temple to pray, or to be religious to be pious. with Amma and then with Hubby dear, while still holding on to my beliefs. these posts were enlightening as much as I could expect. 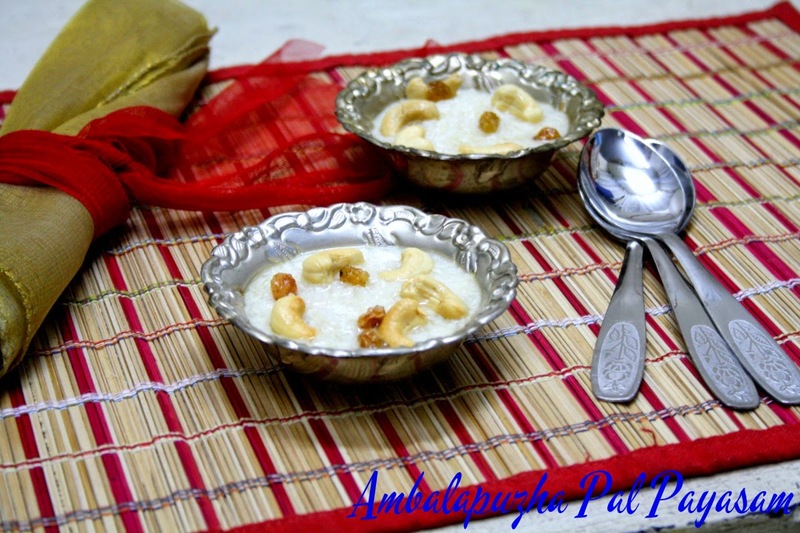 First in the series is Ambalapuzha Pal Payasam, from the Ambalappuzha Sri Krishna Temple. make will taste great, it still would not be the same. is a small town in the Alappuzha district of Kerala state, south India. three important Sri Krishna temples in the state of Kerala. pilgrims every day until the debt was paid off. Basmati rice for this pudding. Wash and soak the basmati rice for 30 mins. Pressure cook the rice and keep aside. 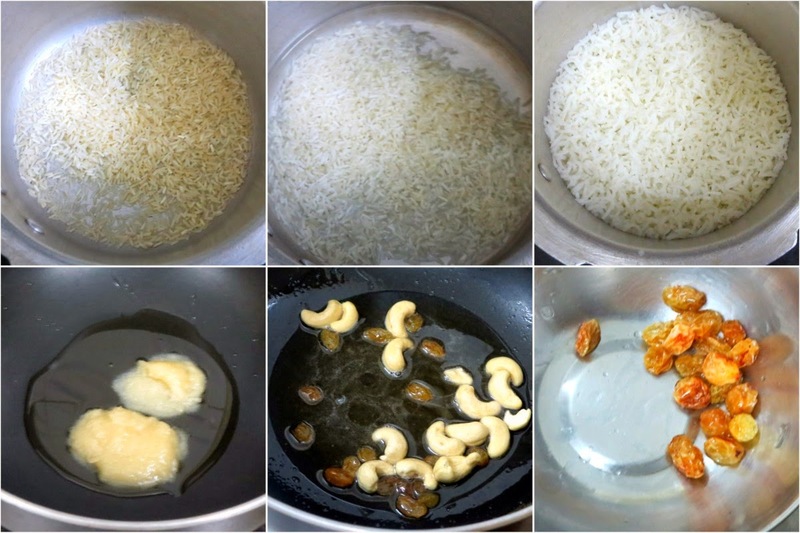 Heat a non stick pan with ghee, fry the cashew and raisins till it turns golden brown. Keep it aside. Next add 2 tsp of sugar and keep stirring continuously until the sugar melts and the colour of the ghee changes to brown. The sugar also caramelizes. Add milk to it carefully and slowly from sideways and bring it to boil. Once the milk starts boiling add the cooked rice to it and again allow it to boil. Now add the remaining sugar. Continue to boil till the mixture becomes bit thick. Now add the fried cashews and raisins and cardamom powder. Mix well and switch off. 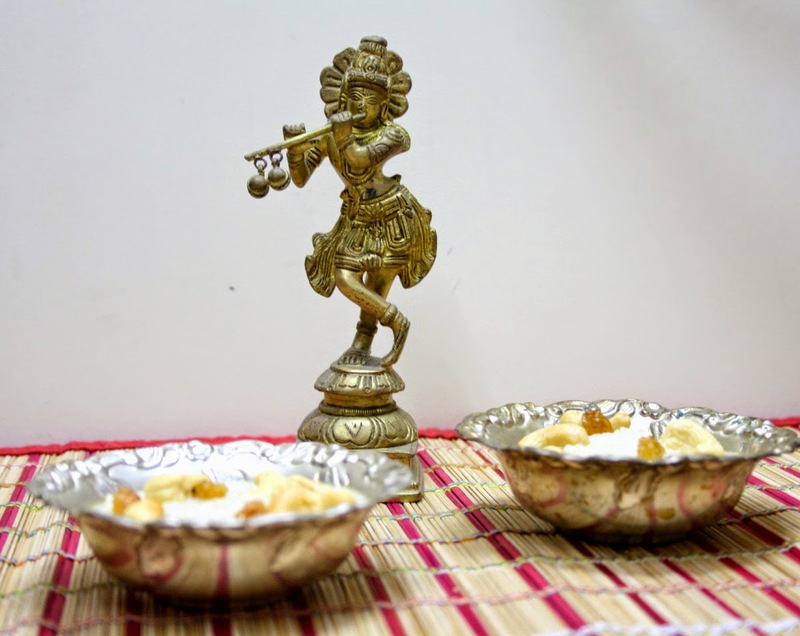 Offer as prasadam to Lord Krishna before partaking. When you are trying to brown the sugar, don’t wait for long as it will hard. Simmer before adding the milk, else it might curdle. its so nice to learn about the different types of prasadam. What a lovely prasadam and thanks for reminding the story of Krishna! I will be talking about this story tonight for my kid's bed time. This is my favourite. We go to this temple just to get this payasam and we get it in litres!!! We can actually see the place where they make this payasam. They make it in a very large chembu – the milk is directly taken from the cows over there. Just a small correction. The rice is cooked in the milk. 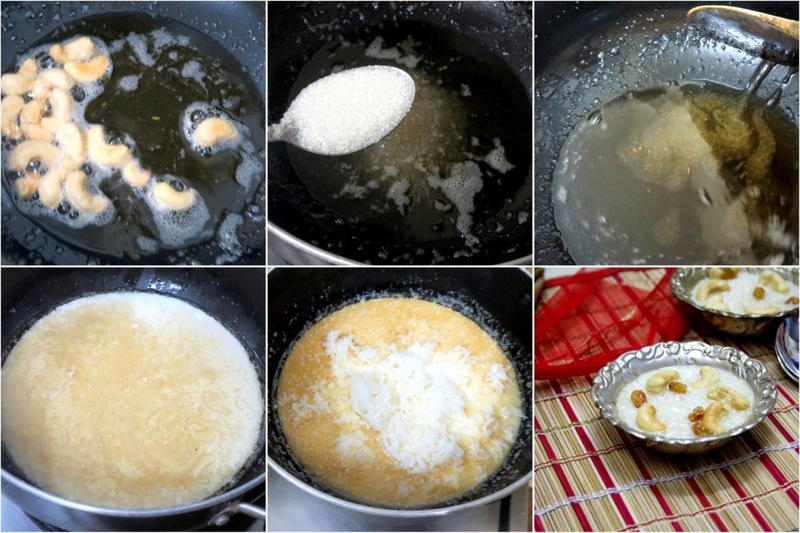 So first boil the milk – add rice, keep stirring until rice is cooked and then add sugar. This is how they do at the temple. At the temple only cardamom powder is added – no cashews/raisins and final payasam will be pink in color which is from the milk itself it seems. Thanks for the theme valli, though i m not well, i really wanted to do this theme!! Payasa prasadam looks delicious and the story behind is very interesting. Thanks to Ruchi, for giving more info on the prasadam. This is the first time, i heard about this temple & this prasadham..sounds interesting.Immediately searched in google and the city & temple are very scenic..The payasam looks tempting and the story behind this prasadham is interesting. Loved the idol in the first picture.. I desperately want to try this recipe now Valli, the payasam and the story is so inspiring to read. Nice one! I guess the divinity passes thru the temple preparations and they taste amazing. 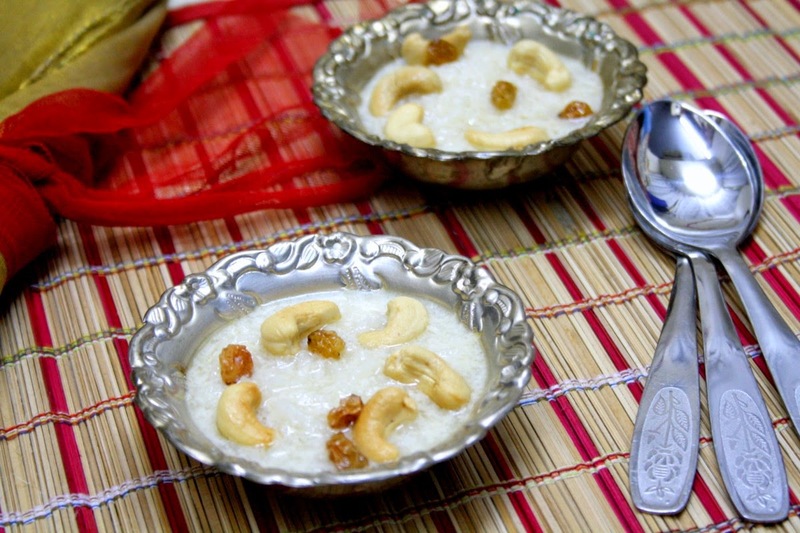 Love the kheer. 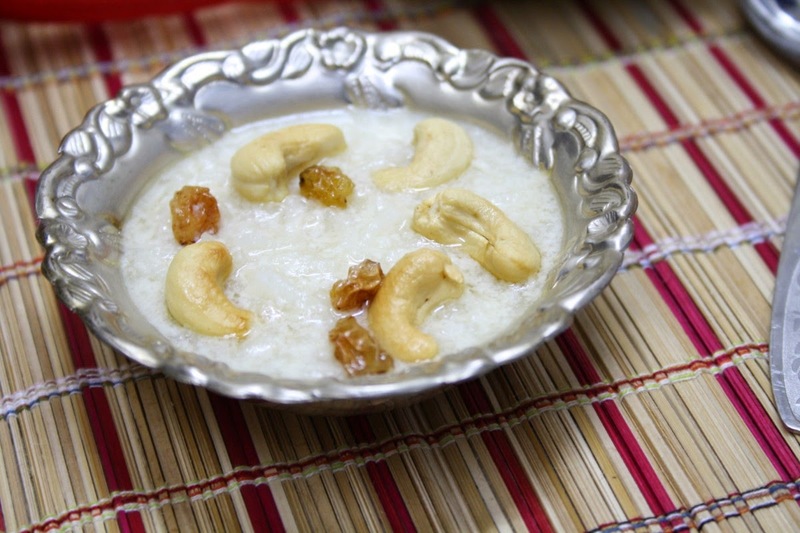 I am no temple goer but I enjoyed reading this post, the payasam looks delicious. Very creamy dish. Enjoyed reading the post.